This is a simple parameter tweaking script for Unity. 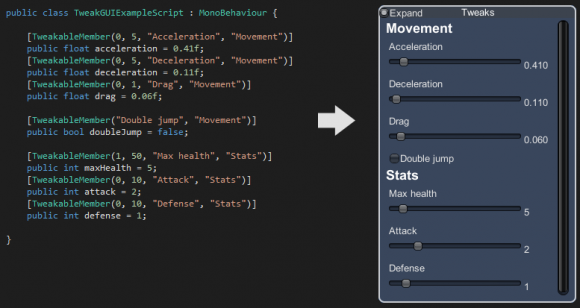 It finds all fields and properties marked with [TweakableMember] in MonoBehaviours in a scene, and enables tweaking from inside the game, which can be useful on tablets etc, where there is no access to the inspector. Simply put the script somewhere in your scene, and mark any fields or properties in your code that should be tweakable with [TweakableMember] and the script will find them. Or you can restrict the searching to specific game objects by setting references to them in the inspector. It works for bool, int and float members at the moment, but is easy to extend. The script is available on Github here. 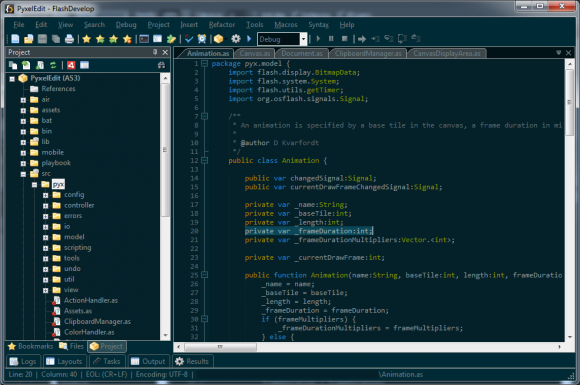 I noticed that FlashDevelop now supports custom UI themes (it used to only support syntax color schemes I think…). I began looking for a nice dark theme but didn’t find one, so I decided to make one. It doesn’t seem possible to customize all the colors, for example the gray borders and the scrollbars, but most colors can be changed. The colors are based on this file by David Pierce https://github.com/dapierce/flashdevelop-colors. I altered the scheme a little bit to suit me better: darker background and other selection and highlight colors. I also changed the font to Consolas (since I didn’t have Source Code Pro). You may need to restart FlashDevelop for all colors to take effect. There is now a beta available of the new Pyxel Edit I have been working on this summer. It is very much updated from the last version, has a completely new GUI, animation support, animated GIF export etc. The original was free, but to support development (I worked on it nearly full time this summer) the new version costs $8, a discounted beta price that will increase as it gets more full fledged. 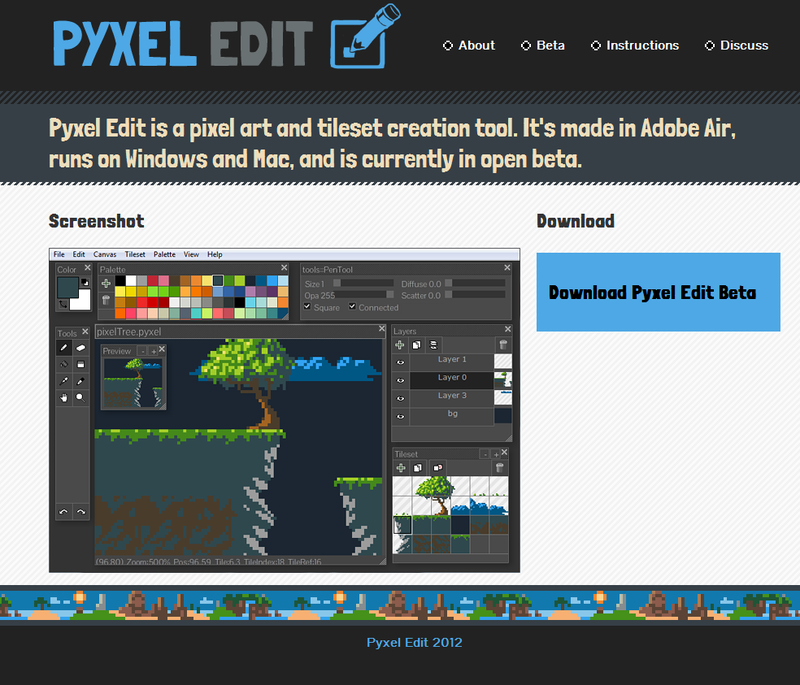 If you make pixel art, tilesets or animations check it out at pyxeledit.com. Short story: In flash, bitmapData.lock() makes drawing faster by only updating the bitmap on screen when calling bitmapData.unlock() after done drawing, but once the bitmap is unlocked the whole bitmap is redrawn, instead of just the changed parts. If you only change small parts of a bitmap displayed on screen, and you do it often, this can result in a big performance hit. 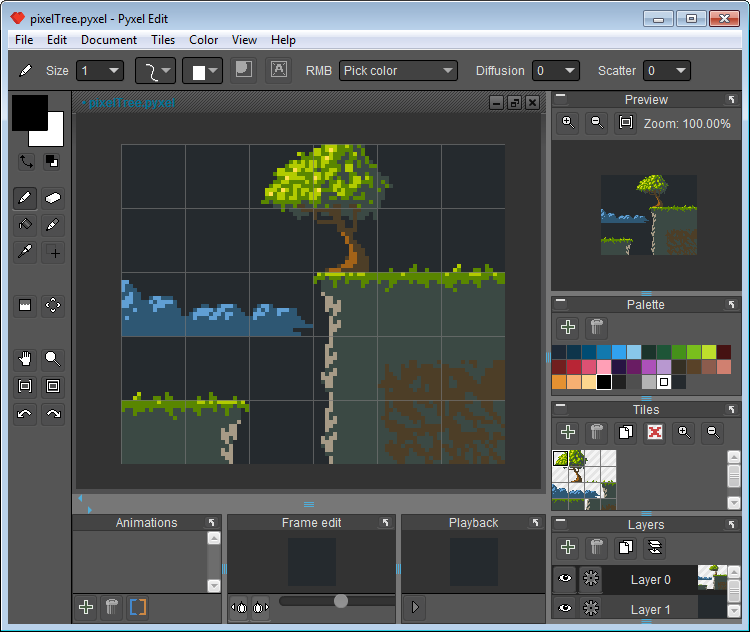 I had been trying to optimize rendering of the canvas in Pyxel Edit without much luck, but then I tried Adobe Scout (awesome application btw!) that let me know that most of the time in the application was spent by the flash runtime rendering the display list. Apparently the whole canvas was re-drawn each time it changed just a bit. The odd thing was that the brush preview bitmap which is displayed on top was only rendered where it changed. After some experimenting I found out that locking the bitmapdata of a bitmap object, which supposedly makes drawing faster, invalidates the whole bitmap and makes it get redrawn. Commenting out canvasBitmap.lock() immediately cut the displaylist rendering time by about 1/3 when drawing in the application. To see what parts of the displaylist are redrawn one handy function is flash.profiler.showRedrawRegions(). It will draw rectangles around each redrawn region. In an old post I explained how to shoot an object to hit a moving target in 2D. The method in 3D is basically the same, but the code below is much cleaner and might be simpler to understand even for the 2D case. // direction to the cannon and the part tangential to it. // velocity on dirToTarget using a dot product. // result from the target velocity. // THIS IS THE MAIN INSIGHT! // Shot is too slow to intercept target, it will never catch up. // Do our best by aiming in the direction of the targets velocity. // We know the shot speed, and the tangential velocity. // Using pythagoras we can find the orthogonal velocity. // Finally, add the tangential and orthogonal velocities. If you want to find the point where they meet, you can calculate the time it will take, and then multiply the shot velocity by that. In practice they will collide sooner since they have a certain radius, but we can take that into account when we calculate the time. The Caps Lock key is mostly just an annoyance. But there are ways to make it more useful. I recently found a very nice script by Gustavo Duarte called Home Row Computing which maps Caps Lock as a modifier key that lets you navigate in text Vim-style using H, J, K and L. This is very handy as you don’t have to move your hand back and forth to the cursor keys while typing. It also maps Home, End, Page Up, Page Down and Del to easy accessible keys from the home row. The script required remapping the Caps Lock key to another key in the Windows registry though, so I started improving it a bit. I added some new functionality and customized it to my preferences. 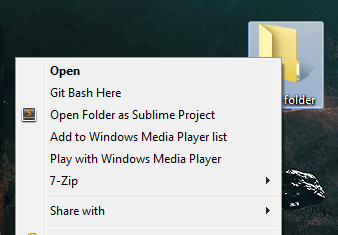 I also added another very handy function that lets you drag anywhere on a window to move it while holding Caps Lock, the way you can do while holding the Alt key on Linux. I got that feature from an article at How-to-geek, changed the key from Alt to CapsLock and added it to the script. Very handy indeed! You have access to all the common keys on the right side of the keyboard (Cursors, Home, End, PgUp, PgDn, Ins, Del) from your home row, which is very handy when typing! Common commands like cut-copy-paste, undo-redo, backspace-delete are also very easy to access giving less hand movement. You can still toggle caps lock if you need to by pressing the Windows Key + Caps Lock. 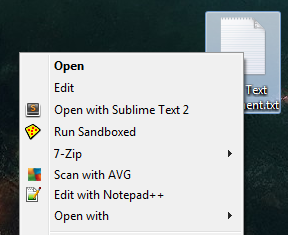 Put the script (or a shortcut to it) in the Startup folder so that it runs each time you start you computer. I chose keys that are consistently placed for QWERTY layouts, some keys might have to be changed for QWERTZ or AZERTY. Let me know in the comments if you have any suggestions or comments. The cursor key layout should be more familiar than the Vim-style layout to most people, and much easier to learn.